MIAMI (AP) - One in four children in the United States is being raised by a single parent - a percentage that has been on the rise and is higher than other developed countries, according to a report released Wednesday. "When our parents married, there was a sense that you were marrying for life," said Edward Zigler, founder and director of Yale's Edward Zigler Center in Child Development and Social Policy. "That sense is not as prevalent." Single parents in the U.S. were more likely to be employed - 35.8 percent compared to a 21.3 percent average - but they also had higher rates of poverty, the report found. "The in-work poverty is higher in the U.S. than other OECD countries, because at the bottom end of the labor market, earnings are very low," said Willem Adema, a senior economist in the group's social policy division. "For parents, the risk is higher because they have to make expenditures on childcare costs." The report noted that public spending on child welfare and education is higher in the U.S. than in other countries - $160,000 per child compared to $149,000. However, the authors say most of that money is spent after the crucial early childhood years. "This means early investment - including childcare and support for families around the time of birth - could be strengthened," the authors wrote in a separate paper examining the United States. "We have not built in the kind of national support systems for families and children that other countries have," he said. Childhood poverty rates in the U.S. are also expected to climb - 23.5 percent from 20 percent. Adema said the rise is a direct result of the financial crisis and higher unemployment rates. "The financial strain causes all sorts of other strain, so ultimately it might contribute to family dissolution," Adema said. "At the same time, it might bring some families together. I suspect that the response differs across families." 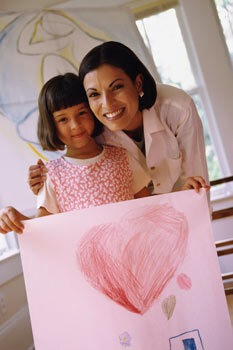 The single parent phenomenon has been occurring over recent decades. The study noted the U.S. and England have higher teenage birthrates than other countries, partially contributing to the higher single-parent numbers, though the proportion of children born outside marriage was not significantly higher than the other countries. Christina Gibson Davis, a professor at Duke University's Sanford School of Public Police, said changing gender roles, the rise of contraception, high incarceration rates in some communities and an acceptance of having children out of wedlock have all contributed to the growing number. Terry O'Neill, president of the National Organization for Women, added it isn't being a single parent in itself that raises difficulties. "Single moms do a brilliant and amazing job raising their children," said Terry O'Neill, president of the National Organization for Women. "It is also true that single moms in this country are systemically underpaid, and systematically under-resourced and systemically unrespected. It's not the fact they are single moms that makes things difficult." Copyright 2011 The Associated Press. The information contained in the AP news report may not be published, broadcast, rewritten or otherwise distributed without the prior written authority of The Associated Press. This article was written by Christine Armario, AP Writer. All active hyperlinks have been inserted by AOL.